Srila Rupa Goswami and his elder brother Sanatana Goswami came to Vrindavan to fulfill the desires of Sri Chaitanya Mahaprabhu. He had given them four orders and they were: – to uncover the lost pastimes of Lord Krishna, installation of Deities, write bhakti-shastra’s, and propagate the rules of bhakti-yoga. Sri Rupa Goswami established the Deities of Radha-Govinda in Vrindavan. Sri Rupa Goswami’s Samadhi and Bhajana Kutir are in Seva Kunja and they are within the courtyard of the Radha-Damodara Temple. He was also a devotional teacher, poet and philosopher of the Gaudiya Vaishnava tradition. Along with his brother Sanatana Goswami. Rupa Goswami is considered to be the most important of the Six Goswami. The brothers Rupa Goswami and Sanatana Goswami lived in Vrindavan for the rest of their lives. Rupa Goswami explored all the places associated with the pastimes of Lord Krishna. He also rediscovered the famous deity of Govinda deva, and it was originally installed and worshipped by Lord Krishna’s great-grandson. They gave initiation to their nephew Jiva Goswami and he was trained in the philosophy of Gaudiya Vaishnavism. They performed transcendental activities like bhajans, chanting, hearing and remembering Lord Krishna. Rupa Goswami appeared in the year 1493 AD and Disappearance was in the 12th day of the bright fortnight of Shravana, and he was 73 years old. 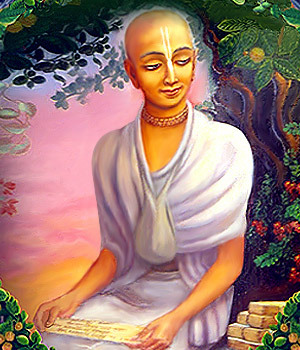 He was extremely dear to Sri Chaitanya Mahaprabhu. Sri Rupa Goswami is the topmost maid servant of Sri Sri Radha and Krishna, head of the Gaudiya Vaisnava Sampradaya. He appeared in East Bengal, and he was the son of a pious Brahmana named Kumara deva with his brothers Sanatana and Anupama. In their adult life served under the Muslim king as ministers and they were at that time known as Dabir Khas and Sakir Mallik. Later being influenced by Sri Chaitanya Mahaprabhu gave up their service of the government and took to renounced order of life. The two brothers lead a very spiritual life in Vrindavan. They spent time doing devotional service, austerity, writing transcendental literatures, visiting Lord Krishna’s place of pastimes and chanting the Holy Name. Their food was a frugal meal of fried chickpeas and dry chapathi to keep the body together. Rupa Goswami’s disappearance day this year falls on 23rd August.